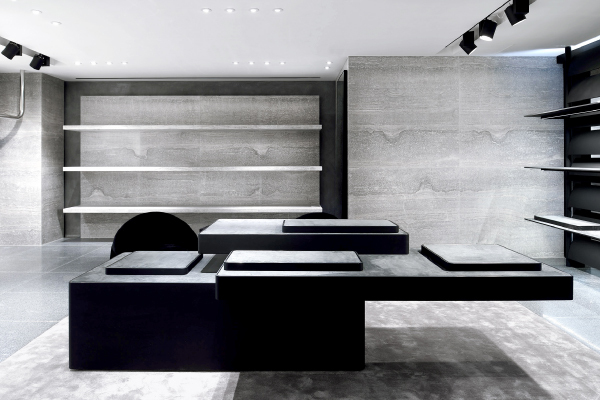 The Alexander Wang boutique was relocated within Harbour City to the prime location of ground floor. The 970 sq.ft re-modeled boutique houses the labels womens ready-to-wear, accessories, footwear, T by Alexander Wang and the Objects collection. Wang is meticulous in expressing his aesthetics. This can be seen from his collections to the fixtures used in his stores. Customers in Hong Kong will feel this as they soak up some of his New York SoHo cool, which has been carefully crafted into this new store. His collaboration with the renowned architect Vincent van Duysen of VVDA, has produced a special place within Hong Kong’s largest shopping mall. The grey and black monolithic stones and travertine shelving are lifted up by a large luscious contemporary rug, centrally positioned. The Italian luxury furniture maker, Poltorona Frau, realizes Wang’s aesthetic through custom made furniture, which has been carefully positioned to maximize the feeling of space. The stark atmosphere compliments Wang’s signature attitude in mixing sharp tailoring with sports elements in this eponymous collection. For Spring Summer 2015, track pants got a sartorial make over with high-wasted bands and curved welt pockets. White tennis skirts are embellished with grommet details. Fluid mini dresses feature a combination of aerated basketball mesh and sculpted leather panels. Technical bonded foam garments - inspired by textured rubber soles - produce bold, graphic surfaces which add extra depth to the surrounding materials used within the store. This collection and store design stays true to van Guysen’s philosophy of “focusing on the essence of the art of living” and of course the Alexander Wang style, which we all so admire.